This year’s BBC Proms in the Park on 11 September with feature performances from Oliver! star Kerry Ellis and Queen guitarist Brian May. Songs from hit West End musicals Jersey Boys and Oliver! are to feature in this year’s BBC Proms in the Park, it has been revealed. Kerry Ellis, who plays Nancy in Oliver! at the Theatre Royal Drury Lane, will take to the stage in Hyde Park on September 11th 2010 with Queen guitarist Brian May in order to add a theatrical twist to the annual classical music event. Meanwhile, the cast of Jersey Boys will kick off the afternoon’s events after being introduced by BBC Radio 2′s Ken Bruce, WhatsonStage.com reports. After all of the entertainment has been enjoyed in the park, a big screen will link up with the Royal Albert Hall in order to hold a nationwide sing-along for the Last Night of the Proms. The BBC Proms is the world’s largest classical music festival and is now in its 15th year. 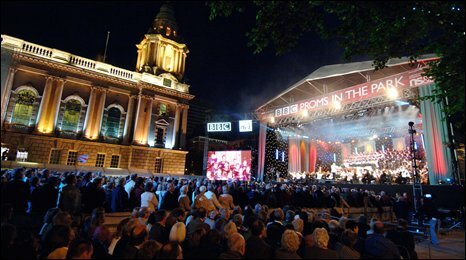 It is thought that 40,000 people will flock to Proms in the Park in September in order to take part in the festivities. BBC Proms in the Park tickets are now on sale for one of the biggest events on the music calendar, descending upon Hyde Park in September 2010. Click here to get tickets for the 76 Proms at the Royal Albert Hall and 13 chamber concerts at Cadogan Hall.